© 2019 Wu X, et al. This is an open-access article distributed under the terms of the Creative Commons Attribution License, which permits unrestricted use, distribution, and reproduction in any medium, provided the original author and source are credited. Assessing the performance of diagnostic tests for repeated binary measurements is very important in clinical trials and diagnostic medicine. The gastric-emptying studies [1,2] involve 4-hourly measurements of emptying. Empirical results suggest that the gastric emptying results over time are correlated and therefore failure to consider the correlation in statistical measures may not produce satisfactory assessments. If these measurements are highly correlated/associated, early gastric emptying can be used to predict late gastric emptying which offers an opportunity to reduce the number of repeats. Although the likelihood ratio has been the most widely used statistical measures for assessing the test performance, the choice of the compromise between the likelihood ratio positive and the likelihood ratio negative needs investigators' clinical experience. In this article, we propose a correlation statistic to assess the performance of the test for repeated binary measurements. 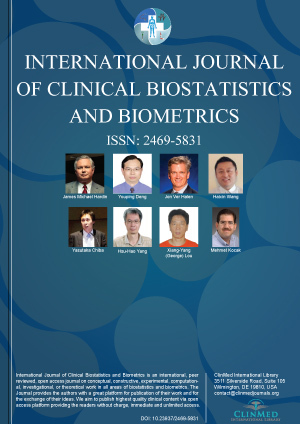 The statistical measure aims to identify an acceptable balance between sensitivity and specificity and produce a unique assessment for the test performance by using the estimator of the correlation coefficient based on a correlated bivariate Bernoulli distribution. Simulation studies are conducted to compare our proposed statistical measure to other measures. The simulated results indicate that our proposed statistical measure performs well. Using our theoretical approach, we find that the greatest correlation statistic always corresponds to the smallest average absolute likelihood ratio and are approximately close to the greatest Youden's index. We further analyze a real gastric emptying data set and identify a threshold using our proposed statistical measure. Shesh N Rai, Biostatistics Shared Facility, Department of Bioinformatics and Biostatistics, JG Brown Cancer Center, University of Louisville, Clinical Translational Research Building, 505 Hancock St., Louisville, KY, USA, 40202, Tel: 502-852-4030, Fax: 502-852-7979.